This unique program offers participants the opportunity to spend the entire day with the training staff at the Roatan Institute for Marine Sciences. Go "behind the scenes" and learn about their daily care and food preparation. Also, learn about dolphin anatomy and training techniques during "hands-on" interactive sessions with the dolphins. 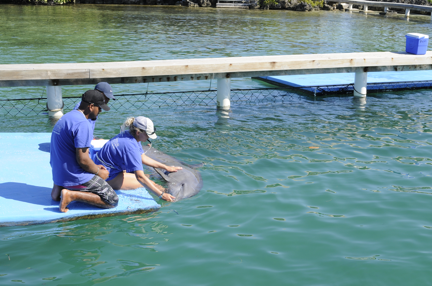 Participants will also have the chance to work one-on-one with the dolphins and initiate trained behaviors both in and out of the water.